The cooker hob, sink, fridge, or other kitchen stainless steel appliances require special products to be cleaned. And you don’t want to use chemicals because they harm your health? Well, you should see the following natural remedies that will make your stainless steel appliances to shine. 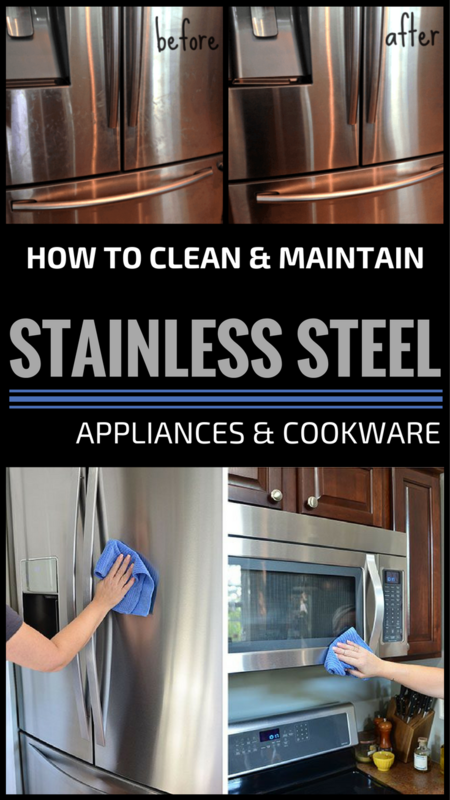 To clean properly stainless steel surfaces and appliances, you don’t need a product that scratches or leaves stains. You need something to disinfect and clean, leaving the objects shiny-new. You can use a solution made from baking soda and water. You don’t need certain amounts just add ingredients to form a paste. Don’t use rough sponges to clean stainless steel, even if you are dealing with hardened food debris or burnt food. It’s better to leave the pot to soak in this baking soda paste, or put the pot to boil with equal amount of vinegar and water, otherwise you risk scratching the stainless steel material. After cleaning and wiping the stainless steel appliances (for wiping use a microfiber cloth), pour some olive oil on a kitchen cloth and polish the entire stainless steel surface. You can wipe the olive oil excess with a dry cloth.